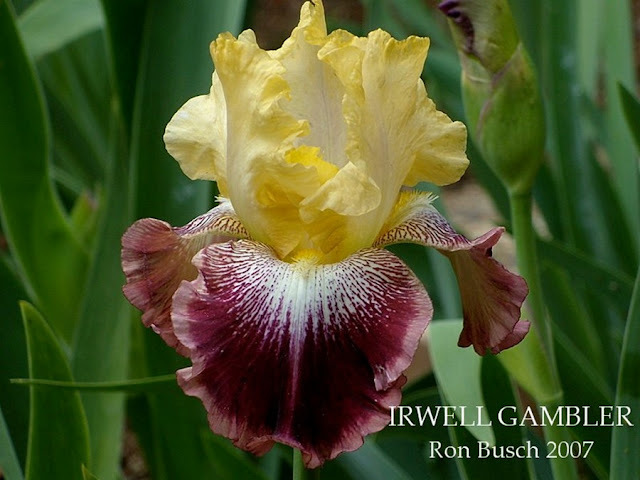 New Zealand iris breeder Ron Busch passed away peacefully on the 21 August 2012 at the age of 77. Earlier this year he was awarded the Dykes Medal, the highest iris hybridising accolade, for his 2008 introduction 'Norma of Irwell' named after his lovely wife, Norma. Ron worked at the Department of Scientific and Industrial Research (DSIR) at Lincoln, Christchurch, improving potatoes and other vegetables. As a passionate plantsman, Ron's interest extended from plant breeding at the DSIR to his efforts at home. He first started breeding irises in 1958, after reading the chapter “Breeding Bearded Irises” in Jean Stevens’ “Iris and its Culture”. He thought 'I could do that' and there is no doubt he did. He registered his first Iris in 1969 a Tall Bearded he named 'Open Country'. 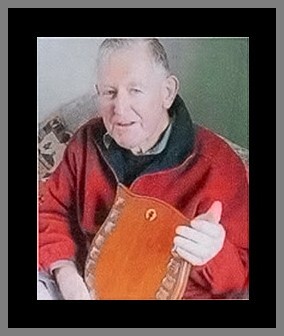 Ron joined the Christchurch Iris Circle (CIC) in 1964 and held office at various times. He was always very happy to give advice on hybridising and the group were most pleased to have a quality hybridiser among their membership. His breeding interests covered Siberians, Cal-sibs, Standard Dwarf Bearded and Tall Beardeds He also imported Arilbred and oncobred irises in the sixties and his garden at that time contained many Aril and Arilbred varieties and seedlings. 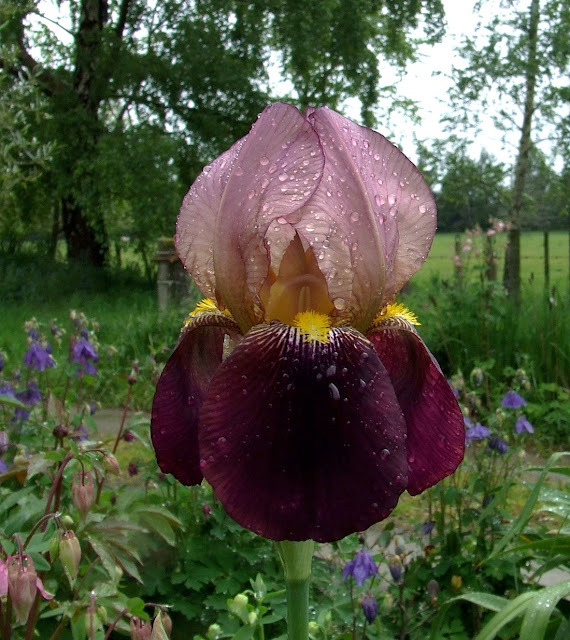 His aim was to improve colour, form and substance in the irises he bred. Never secretive with his breeding program, always planning ahead, he delighted in experiment, and passionately wanted everyone to join with him in the iris breeding journey. He contributed much to the iris world, leaving behind a substantial and rich legacy of 188 registered varieties including some yet to be introduced and more potential registrations to be selected from the many recent seedlings. His late home and garden located at Irwell Village in Canterbury had a kindly climate coupled with great soil that allowed the irises he loved so much to grow under ideal conditions. Ron left this world as a hybridiser should - at the beginning of spring, just as nature prepares the garden for new bloom. So each year when Spring awakens the earth he loved so much, his colourful and vibrant flowers will once again burst into bloom, and somehow I don't think he will be too far away. Hard to believe really that this good looking Australian bred tall bearded iris will be classified as historic in 2 years time. A strong grower that has good bud count and medium size blooms that arrive mid-season. According to its registration description its supposed to be a blue and white amoena but it's more of a near amoena with the standards washed ever so slightly with the lavender blue colour of the falls and this stylish iris is topped off by its tangerine beard. 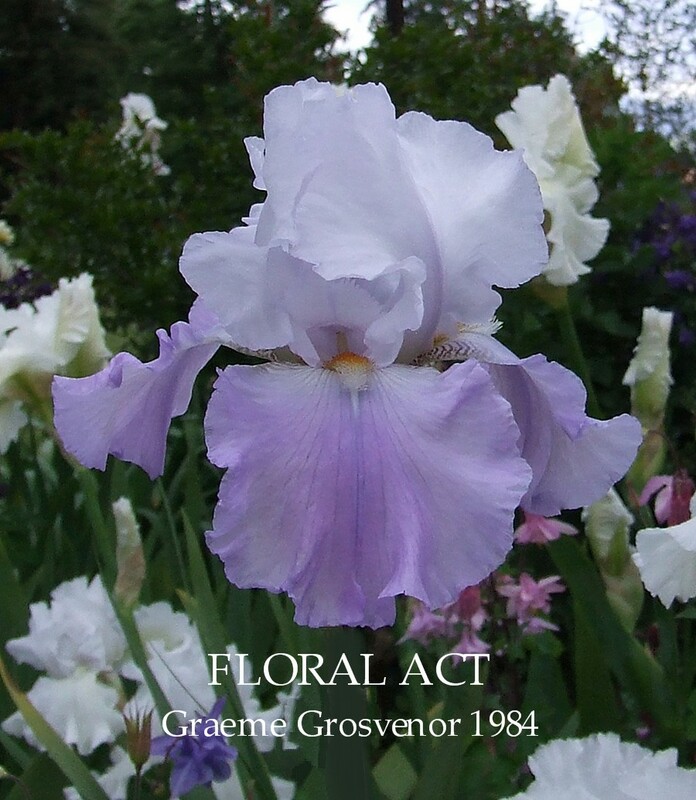 It is somewhat bemusing to read the registered checklist description where it states 'red beards' yet in 1992 Graeme Grosvenor goes on to describe 'Floral Act' in his book 'Irises' 2nd edition, as having white standards, pale blue falls and tangerine beards. (slight step change? You think?) Once again another iris with 'Sunset Snows' in the parentage. All and all a great garden iris the can on occasions produce a winning show stalk. FLORAL ACT Graeme Grosvenor, Reg. 1984 Sdlg. H2-2. TB, 36" (91 cm), E-L. S. white; F. blue; red beard. Rellie X Actress. Rainbow Ridge 1984/85. It's very rare to find a twenty first century New Zealand bred Iris growing in America yet here we have one. Photo taken of 'Irwell Gambler' growing in the garden of Betty Jacobs, Bakersfield, California. Betty writes "After the plant arrived in the States it took three years to bloom finally doing so in the Spring of 2011 -- and WOW! How I loved it!" I have seen 'Irwell Gambler' growing in several New Zealand gardens and been impressed with it's strong growth, good branching, good bud count, and it's ability in the right growing conditions to quickly form a good clump. A brilliant and very flashy variegata with its bright lightly ruffled lemon standards with bold rich plum falls that are enhanced by the softer plum toned ruffled edge. The ring of white striations surrounding the lemon beards contributes to the very masculine look. Irwell Gambler, Busch 2007 (NZ), Heather Pryor's choice. Lemon standards. Plum red falls with paler edge and white veining around the beards. IRWELL GAMBLER Ron Busch Reg., 2007. Sdgl.8888/1 TB, 38″, (97cm), M. S. and style arms lemon; F. plum red, ¼″ paler edge; 1″ area of white veining around lemon beard. Snow Spoon X Extravagant. Rossmore Gardens 2007. Waimate Iris Garden 2007. Snow Spoon is the pod parent so there could be good breeding lines for space age irises if someone is interested in giving it a go. "Mr Bliss has given us marked improvements on then existing forms over a wide range of colours. This improvement is not so often a matter of size and height as it is of branching, poise, and a freedom of flowering, factors of utmost importance in the development of varieties for the garden. We have a strong tendency to over emphasise qualities that are of importance on the exhibition table, and to forget that the Iris is fundamentally a flower for the hardy garden. In that Mr Bliss has rarely made this mistake his varieties will tend to live and to receive more, rather than less, appreciation." AN AMERICAN VIEW OF IRISES, R. S. Sturtevant, Bulletin No. 2, The Iris Society, 1925. About 20 years ago, Anne Milner was offered two irises bred by her great uncle 'Arthur Bliss' when researching her family history with a distant cousin. Her cousin explained that her mother, Phyllis, used to help Uncle Arthur as a child and that Phyllis had these two irises directly from him. These two irises were supposed to be Dominion and Cardinal. Dominion was a famous iris as it was the fore-runner of many modern irises. From the gift of these two irises the National Collection of Arthur Bliss Irises was born. Anne is also interested in finding other Bliss Irises, and would love to hear from anyone who has any information about where any might be growing and the web site has a list of all his irises and the dates of introduction.. Please visit the web site by clicking on the avatar below to go directly to the site. Heritage Irises takes this opportunity to wish Anne all the very best with her new web site and a continued growth with her collection. Clicking the above top image will take you to the larger, higher resolution version. Tell's Iris Gardens, Orem, Utah. Tell's Iris Gardens Proudly Presents New for 1974. Melrose Gardens, Stockton, California. The Connoisseurs Catalog, 1981. FESTIVE SKIRT (Hutchings '74.) Still the best rose and white "pink" amoena. This amoena has white standards that are flushed salmon-pink and salmon-pink falls that are paler in colour around the edges. The beards are orange. The petals are slightly ruffled. Height 89 cm. (35½ in.) Bloom mid-season.Parentage includes La Parisienne, Barbara Luddy, Just Annie, Golden Eagle, Pinnacle, China Gate, Numero Uno, and Sunset Snows. FESTIVE SKIRT F. Hutchings, Reg. 1973 Sdlg. 71-28A. TB, 35" (89 cm), M. S. white; F. salmon with pink overlay; orange beard; slight ruffling. 68-61: (inv. La Parisienne, Barbara Luddy, Just Annie, Golden Eagle, Pinnacle, China Gate, Numero Uno) X Sunset Snows. Tell 1974. 'Festive Skirt' is in the parentage of another of my favourite irises I grow at home 'Oriental Alabaster'.